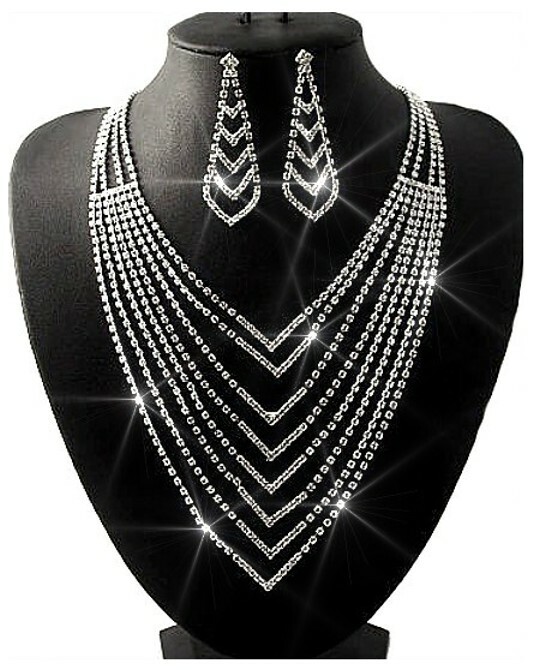 Very dramatic and totally dazzling, the Chevron Set is inspired by the necklaces worn by Hollywood greats such as Rita Hayworth, Marilyn Monrow and Audrey Hepburn. Utterly dramatic and very Deco, it features eight strands of small, exquisitely-cut dazzling diamante, which run parallel, creating the unmistakeable Chevron shape. Matching earrings complete the look - perfectly. Length 28cm (11") + 10cm (4") extension Centre drop: 9cm (3½") Earrings: 6cm (2½").